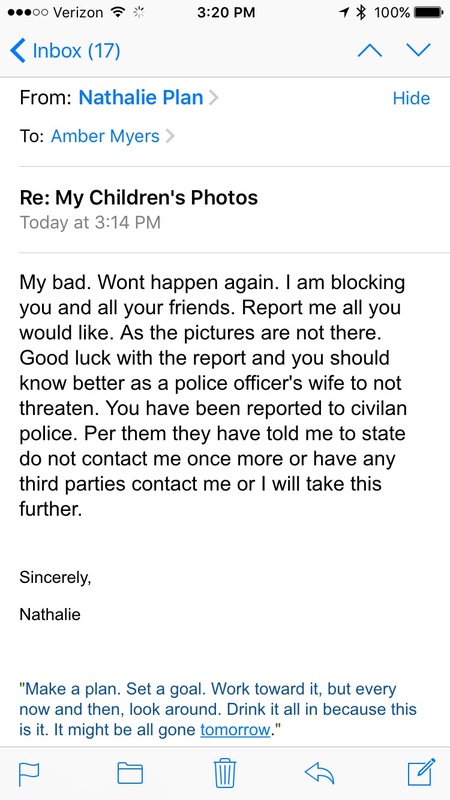 The other day I had messages from people telling me that a woman was using my children's photos on her Facebook page. Unfortunately, this isn't the first time it has happened. People on eBay love to use Natalie's photo when they are selling stuff. Some people suggest using a watermark, and I might start doing that, but the super sneaky people know how to get rid of it. This woman had me blocked, so I was unable to report her. I told my Facebook friends what was happening and was grateful when many of them began reporting her. Some even sent her messages asking what she was doing. Apparently she was saying my kids were "Kia" and "Michael" and that they were her niece and nephew. A few people realized they had Facebook friends who were friends with her, so they got in contact with them. This woman has a long history of lying, from what I was told. Another friend found her e-mail address and passed it onto me. 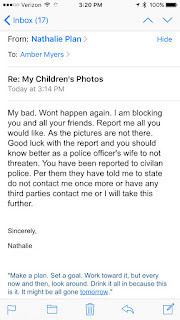 (She has a Sitter City account and I'm no expert, but someone who lies and steals photos probably shouldn't be watching other people's children..) I asked the woman to stop lying and to take down my children's photos. Yes, I did mention my husband was military police and knew other police officers who could make her life unpleasant if she didn't stop. It's creepy. I don't know this woman. Unfortunately social media makes it easy for people to steal other people's stuff. Photos. Writing. Identities. I've seen enough episodes of Catfish to know how simple it is to become someone else. So everyone please take caution. I'll be checking my photos often in Google Search to ensure someone else isn't using them. I suggest you do the same. And I want to thank everyone who came forward to let me know what was going on. It was a frightening situation, yes, but it helps to know that I have fantastic friends--many who I've never even met--and they are willing to look out for my family and I.
Wow - very creepy! Not to sound like an internet idiot, but how do you use Google search to see if others have your pictures? You go to Google Images and you can either drag a photo to the box or upload it to make sure no one else is using it. Wow. All I can say is I am so glad that you found this out. Seriously she sounds like a nut case especially her reply to you...how in the world does she think that's okay and then for her to turn around an threaten you? Wack job! So creepy! I reported her too. I hope she gets all her stolen photos taken down! This is so freaking weird. And that response she sent you...she needs help. That is so creepy. I have never checked my photos but I guess I should. She obviously has done this before since she has a response ready. Sounds like a psycho to me. Glad you have people looking out for you. It's so scary as a blogger/someone who works on social media, but we also know the risks. I am so glad that you have a strong support group that helped you get them taken down! Wow. Just wow. This is insane. And her response to you was the most insane part. "My bad"???!!! No apology, just a threat towards you? I can't. Her reply is the creepiest part! Trying to frame it so YOU look like the one who's crossed boundaries?! WTF-ever! That's awful! SO sorry to hear this, but so happy others are looking out for you all. Thanks for the information - I'm going to be checking mine for sure. She sounds like a nut job for sure! I remember I emailed you about this woman a couple yrs back when I asked you if you knew this person who stole your kids photos after her telling me your kids were her niece and nephew and that your kids photos were on her Facebook page. I remember also you telling me you didn't know this woman who stole your kids photos and claimed that she was related to you. When I found your kids photos at her brothers page where he was passing your kids as his own page and called him out on it the woman you were writing about on your entry accused me of wanting to ruin other people's lives and how I should not go falsely accusing people. Plus she threatened to get her brother to contact me but I soon blocked her and her brother which all this was a couple of years ago. 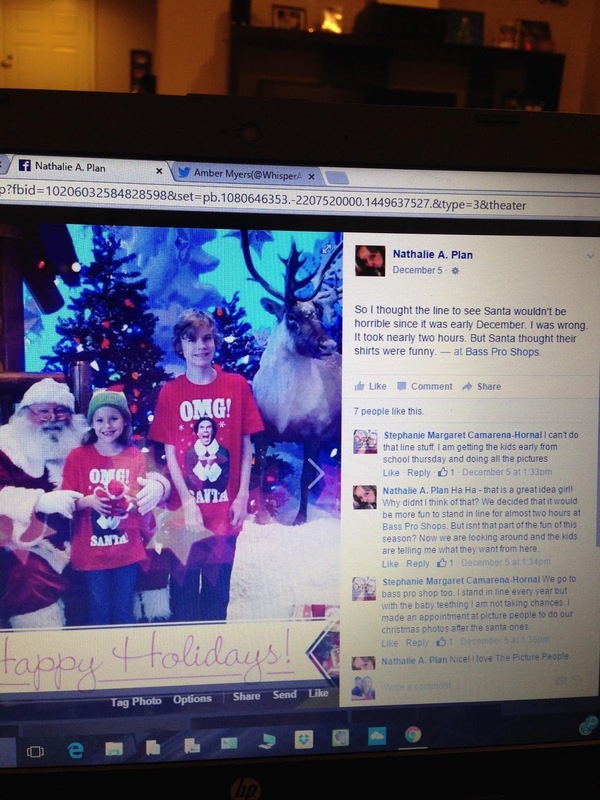 I also told that same woman that I recognized your kids due to your blog here. Now. 2 yrs later she followed me on Instagram and after having read this entry I have blocked her on Instagram and Facebook. Speaking of Facebooj she tried to change her Facebook page where nothing is shown except that she took out the Middle I itial of her middle name. Yes, some people have told me she changed her account. I guess she got a lot of messages from people asking what she thought she was doing. I appreciate you looking out for me! Scary! People are so weird. I'm glad you've got friends looking out for you :)! This is very scary indeed! Glad she took those photos down though. Isn't it interesting how the biggest liars of all try to act like the victim? Ugh! Wow this is crazy. I just can't even believe that people are this insane. Good gosh, what in the hell. I don't even understand what would motivate someone to use someone else's pictures. What a crazy nasty nutcase. I am paranoid about my Facebook profile and have it quite literally on lockdown but my blog links to google and those images are public, so I definitely worry about those and don't use as many of my kids as I once did. But the old ones are still up there and the only way to remove them or make them private is to remove them from my blog. I feel violated just reading your story! I wish I could knock this chick out! that is so creepy!! how do you check your photos on Google Search? Please tell me so I can do the same with mine. Oh, actually I just saw your reply to that question above.. I'll be doing that!!! 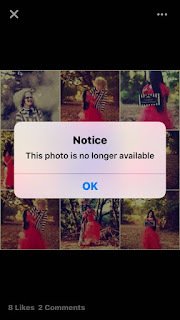 This has happened to me too :( My photos of my children and ME. It's horrible. I'm sorry you had this happen to you. Oh wow - what a horrible thing to do! What would even be the purpose of using someone else's pictures? I'm sorry you were exposed to this. Wow that is absolutely appalling! I will never understand why people do stuff like this and the fact that she acted like you did something wrong by contacting her. OMG I wonder if someone should report her to the police, I mean she is such a case, who knows what else she is doing! Completely insane. You have very adorable kids, but come on. You're a blogger. We all can recognize your kids. This woman is an idiot. And it's really scary for me as a photographer, blogger and parent. Wow! That's a terrible situation as a mom. I hope she had a moment of conviction and sticks by it. 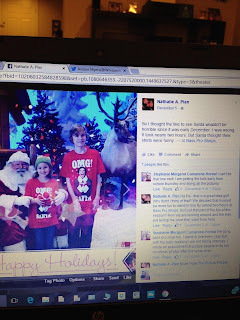 Makes me as a blogger reconsider my use of watermarking! I didn't have a compleat stranger do this. But I can feel your pain. 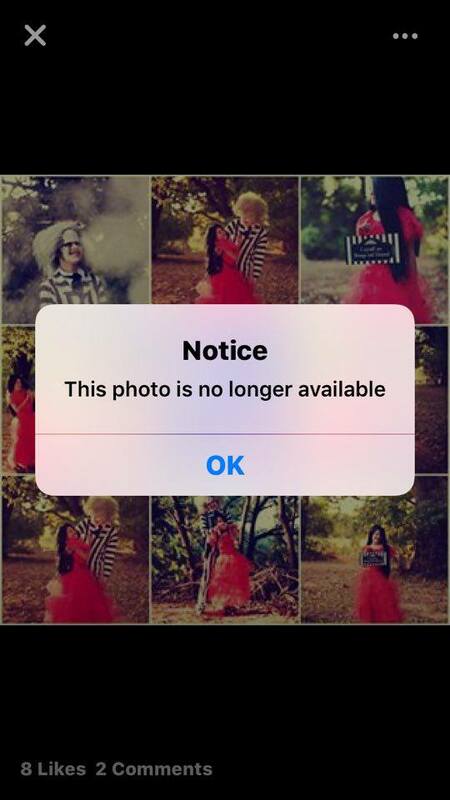 It feels so helpless when you can't protect photos of your kids. That's absolutely terrifying and a reason I don't show much of my kids faces on my blog anymore. I had one of my public photos taken from my Flickr account and put into a viral meme last year and I felt so violated. They took it down and thankfully it was just me and not my kids. My husband used to have a modern architecture website of our town where he posted photos he had taken. So many people stole things from it, people we know even, without permission that he took the whole site down. It's so scary.